Function integration saves times and increases efficiency and productivity. Festo has published a new whitepaper which outlines how machine builders and engineers can improve efficiency and productivity. As well as exploring some typical problems and conflicts faced by machine builders in the project process, it gives a real life application where 14 hours were saved over the course of a project by applying a high level of function integration. When electrical and pneumatic subsystems are separated, all the phases of building even relatively simple systems can take a lot of time. Function integration offers increased reliability, reduced interfaces and saves time along the entire value chain, therefore improving efficiency. In machine building, the scale and the technical complexity of automated systems is constantly increasing. Electrical and pneumatic drive and control technology, decentralised intelligence and special safety and diagnostic functions are mixed and combined with an ever higher level of customisation. 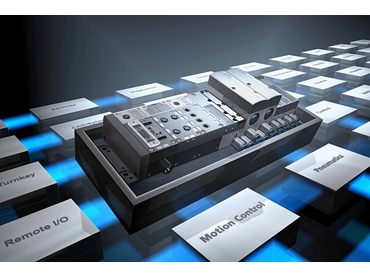 Function integration in automation platforms significantly reduces the number of interfaces and valve terminals while decentralised intelligence support are key to increasing productivity. Functions, previously implemented separately, have now all been integrated into one valve terminal with a high level of electrical and pneumatic integration, therefore enabling machine and system builders to save valuable time during design, procurement, assembly and commissioning. Function integration also reduces the time associated with maintenance and service and by using pre-assembled units, installation times are reduced by 60 percent. Download a copy of the whitepaper.